a collection of serum in the body, producing a tumorlike mass. A mass or tumefaction caused by the localized accumulation of serum within a tissue or organ. /se·ro·ma/ (sēr-o´mah) a tumorlike collection of serum in the tissues. a lump or swelling caused by an accumulation of serum within a tissue or organ. A mass or tumefaction caused by localized accumulation of serum within a tissue or organ. a collection of serum in the body, producing a tumor-like mass. The main complications arising from different hernia repairs in our group are pain and seroma formation, seen as early complication of surgery. There were no significant group differences in postoperative wound infection, seroma, hypocalcemia, or recurrent laryngeal nerve palsy. Post-operative complications included: cerebrovascular accident (CVA), dural tear, hardware failure, new-onset malignancy, paresthesia, paralysis, pseudarthrosis, radiculitis, seroma formation, and surgical wound infection. 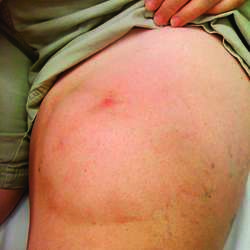 In obese patients with a large space left above the fascia, a small drain can be left temporarily to reduce the risk of hematoma or seroma. Seroma gelisimi laparoskopik vakalarda %8-17 arasinda gozlenirken (16,24), laparotomi uygulanan vakalarda ise %0-66 olarak gorulmektedir (16,25). BACKGROUND: Seroma formation in surgical wounds delays wound healing and increases morbidity in patients (1). 95%), two of which had postoperative seroma and one had postoperative pain. Further debridement can then be performed in sections where the allograft failed to adhere, for instance where debridement was inadequate, or in the presence of infection, fat necrosis, haematoma or seroma. In spite of meticulous care taken by the client, there was dehiscence of sutures with formation of seroma at site of surgery was observed. Postoperatively, she required aspiration of a seroma but her recovery was otherwise satisfactory. 5%) developed postoperative complications, among them seven patients had infection, three had seroma, and two had hematoma [Table 2]. Antiseptic type did not affect rates of skin separation, seroma, hematoma, or cellulitis.